Kon Ichikawa was one of the finest post-war Japanese directors. He was a very prolific director who made 86 films in his life. He was a truly humanistic and anti-war director. The Burmese Harp (1956) and Fires on the Plain (1957) are two of the greatest anti-war films of all time. He was a master of all genres - documentary, melodrama, social satire, samurai swashbuckler, and mystery. His documentary Tokyo Olympiad (1965) is a deeply emotional and humane piece of a work. One of my favorite of his films is the beautifully shot drama The Makioka Sisters (1983). This lovely and sad film will fill your eyes with its luminous colors. Another masterpiece is An Actor’s Revenge (1963), Ichikawa's first widescreen film. This is a very experimental film with stylistic bravado. It is the story of betrayal and revenge in the closed world of nineteenth-century kabuki theater. The movie was written by Ichikawa's wife Natto Wada who was a frequent collaborator of her husband. The main role was played by Kazuo Hasegawa, who composed a magnificently androgynous performance. Criterion has recently released a new 4K digital restoration of An Actor’s Revenge. 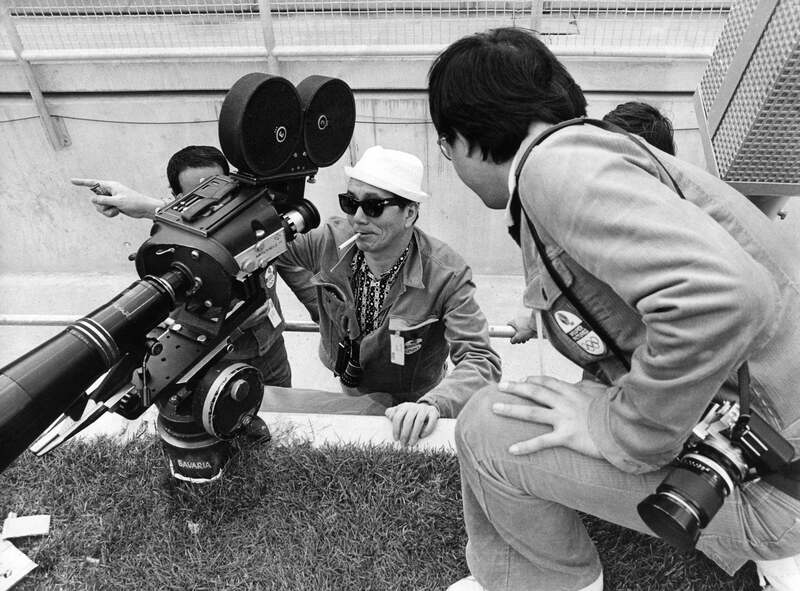 The master at work: Kon Ichikawa shooting his documentary of the 1972 Olympic Games in Munich, Germany. 전후 일본 영화계의 거장 중 하나로 생애 총 68편의 영화를 만든 곤 이치가와 감독(2008년 92세로 사망)의 ‘배우의 복수’(An Actor’s Revenge-1963‧사진)는 가부키 배우를 주인공으로 한 배신과 보복의 걸작 멜로드라마이다. 19세기. 유키타로는 7세 때 부모가 세 명의 탐욕스런 상인들로 인해 자살을 하는 비극을 맞는다. 그를 입양한 사람이 오사카의 가부키 배우 매니저 기쿠노조 나카무라. 자연히 유키타로는 성장해 가부키 배우인 오나가타가 된다. 예명은 유키노조. 오나가타는 여자 역을 하는 남자 배우를 일컫는 말로 이들은 실제 생활에서도 여자 옷을 입고 여자의 어투와 태도를 그대로 간직하고 산다. 그래픽 디자이너로 만화영화로부터 시작해 디즈니로부터 큰 영향을 받은 이치가와는 일본 전후의 사회문제 노출을 두려워 않는 사회의식이 강한 감독이었다. 아키라 구로사와와 비견할 만한 감독이었다. 그는 예술영화뿐 아니라 사무라이 영화, 멜로드라마, 풍자 코미디, 기록영화 및 미스터리 등 전 장르의 감독이었다. 그의 걸작 기록영화가 도쿄 올림픽을 생생히 담은 ‘도쿄 올림피아드’(Tokyo Olympiad‧1965)이다. 이치기와가 진지한 감독으로서 국내외적으로 인정을 받게 된 영화가 서사 반전극 ‘버마의 하프’(The Burmese Harp‧1956)다. 이 영화와 그의 또 다른 반전영화 ‘들 불’(Fires on the Plain‧1957)은 이치가와의 대표적인 2편의 반전영화로 둘 다 그의 아내 와다가 각본을 썼다. 두 영화는 이치가와의 또 다른 이름과도 같은 것으로 전쟁의 비참함과 함께 다치기 쉽고 지키기 어려운 평화를 숙연히 찬양하고 있다. ‘버마의 하프’는 태평양전쟁 말기 버마전투에서 살아남은 일본군 미주시마가 종전 후 귀국을 거부하고 중이 돼 버마전장 곳곳에 널려있는 전우들의 사체를 맨손으로 묻어주면서 겪는 영적 변신을 다룬 숭고한 작품이다. ‘들 불’은 필리핀 전투에 투입된 패잔 일본군들의 처절한 생존투쟁을 그린 끔찍할 정도로 사실적인 작품이다. 전쟁의 광기와 비인간성을 단죄한 명작인데 살기 위해 인육마저 먹는 군인들의 모습을 보노라면 구토가 인다. 대사가 거의 없는 묵시록적인 반전영화다. 내가 매우 좋아하는 이치가와의 영화가 색채 영상미가 화사하니 고운 ‘마키오카 자매들’(The Makioka Sisters‧1983)이다. 지금도 기모노를 곱게 차려 입은 마키오카네 장성한 아름다운 네 딸이 만개한 벚꽃 구경을 하는 총천연색 장면이 눈에 선하다.